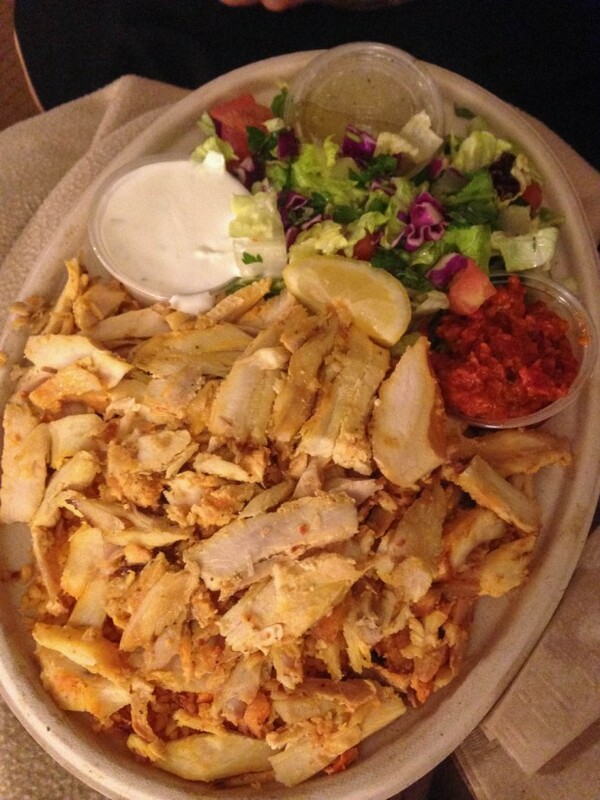 We asked a couple of people: “Where is the very best fast-casual Mediterranean restaurant in downtown San Diego?” Everyone said: “Döner Mediterranean Grill.” So, we knew we had to get over there and give it a try! Located in the heart of the Gaslamp District, and offering terrific Mediterranean food deep into the night, Doner is very popular! It’s so popular, that there’s usually a line of people waiting for their food all night long on weekends. I decided to order both a beef and chicken dinner plate. When you walk into the store, the first thing you’ll see on your left is the huge spirals of beef and chicken roasting. It’s a sight to behold! It also means the restaurant smells amazing! It should be noted that Doner is kind of a fast-casual restaurant. They don’t have table service or waiters. But, you can get your food for-here and eat it in the restaurant. They have high tables where you can wait for your food, and then eat it. Just letting you know that Doner isn’t some sort of romantic Mediterranean restaurant. The wrap is bigger than the gyro. The chicken is wonderful and juicy. The beef was also juicy, and wasn’t chewy or dry. This is a very important factor! Some times you’ll order beef from a place and later regret it. Here, it seems they know what they’re doing! We got the plates, which come with a side salad and veggies. The chicken is served on top of a bed of rice. They have a side sauce that’s spicy you can add on top of your plate if you are looking for a spicy dish. If you check in on Yelp or Foursquare you can get a coupon for a free drink. We really enjoyed our trip to Doner, and recommend it if you are in downtown San Diego looking for a good place for Greek food. Enjoy!